Often Caesar hatches a nefarious plan to conquer the one small village of Indomitable Gauls that still holds out against the Roman invaders. More rarely our heroes get caught up in an external conflict for some reason - and that's what happens the day Chief Vitalstatistix' only fear comes to pass - and it's a conflict of a scale and type not even Getafix could anticipate! This is pure, distilled Uderzo, whimsical, fantastical and of course, down right silly, perfectly fitting for his last Asterix album. So long, Uderzo - you, along with your great friend, Goscinny, have entertained (and even educated) me as long as I've been reading independently and will no doubt bring me much fun in the future, too, even though there will be no new stories from you. The existing ones still delight every time. I hope your successors can retain the spirit of the little village on the coast of Armorica back in 50 B.C. 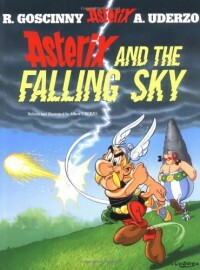 as they bring us new adventures of Asterix and Obelix. I'll find out soon enough.